But something’s happening in Vermont. In the hip art houses of Burlington, at serene coffee shops outside Montpelier and in cozy wooden theaters of rural Rutland, people are coming together to connect with one another, to look each other in the eye, to share laughs and tears and ideas. They’re the storytellers of Vermont. “We’re sort of circling back to that tradition of sitting and listening to people and really hearing somebody else’s perspective,” says Susanne Schmidt. Fame isn’t something most of these storytellers seek and certainly don’t expect. But in her own regard, Susanne Schmidt is a famed storyteller of Vermont. She’s a licensed mental health counselor by day and a storytelling virtuoso by night. She’s also a regional producer for the ultra popular storytelling podcast, “The Moth,” co-creator of a collaboration between comedic storytellers and non-profit organizations called Say It Forward, and a regular storyteller at events all across the state. 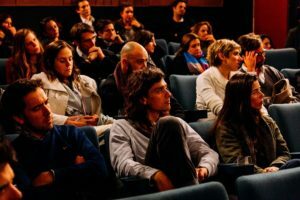 Storytelling shows come in all varieties, but the traditional format is often called a “storyslam,” where people gather at a venue with their story prepared and rehearsed. Names are pulled from a hat, and the lucky few go on stage to tell a five to six-minute story. The stories are always told in first-person, citing their own life experience. On a bitterly cold March evening, a lively crowd of some of Vermont’s best storytellers gathered for a show held at Vermont Public Radio.